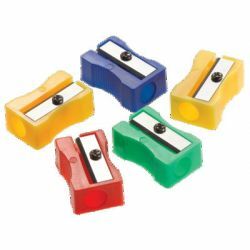 Durable plastic casing of this manual pencil sharpener houses a steel blade to get your pencils consistently sharp. Sharpens #2 size pencils only. Compact size allows for easy storage—perfect for tossing into a backpack on the way to school. 24 sharpeners in assorted colors are sure to brighten up any desk.